Papa Osprey and His Friends. Important Introductions. This past weekend was a delight. The weather was gorgeous between two cold fronts, but even more importantly our son popped in for a short visit. 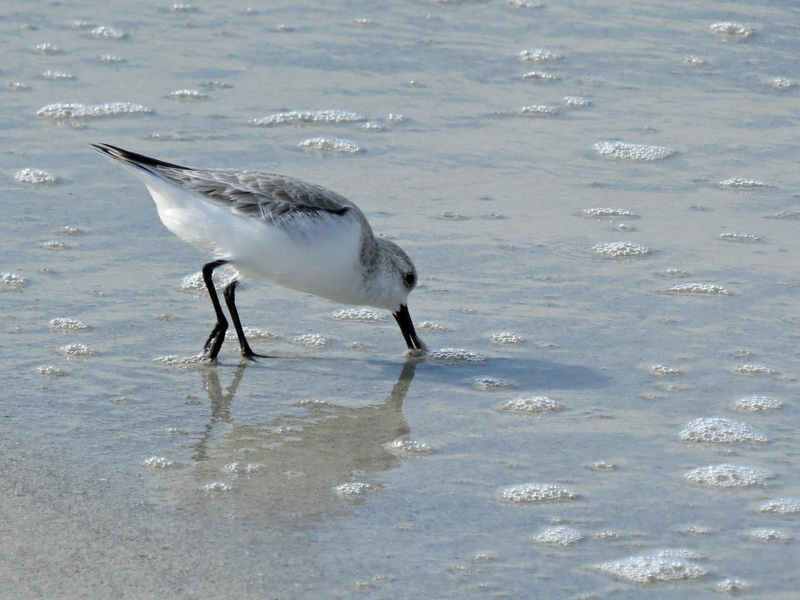 After all the good eating, I took him on a walk to enjoy the beach and to introduce him to my winged friends in the salt marsh. I hoped they would behave. Or at least not go into hiding. 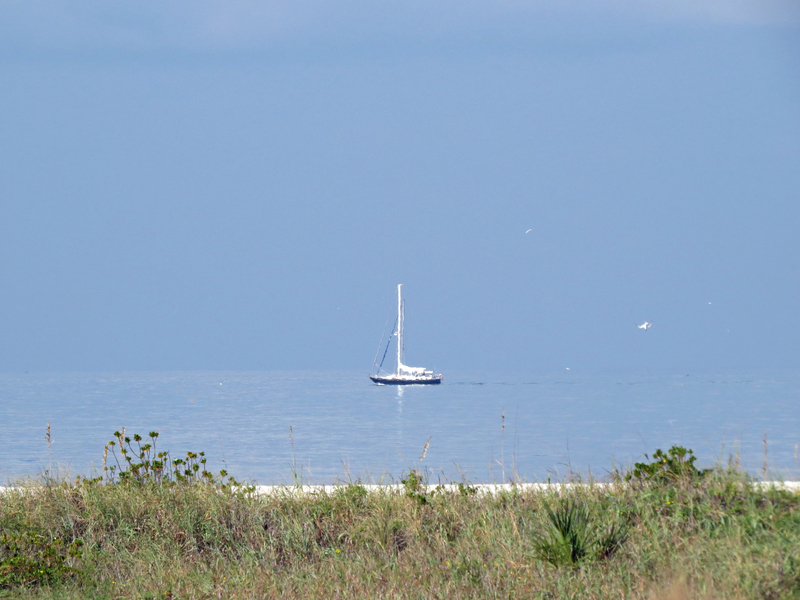 The ocean was sky blue and calm. Sailing school students were gathering for a class little further out. 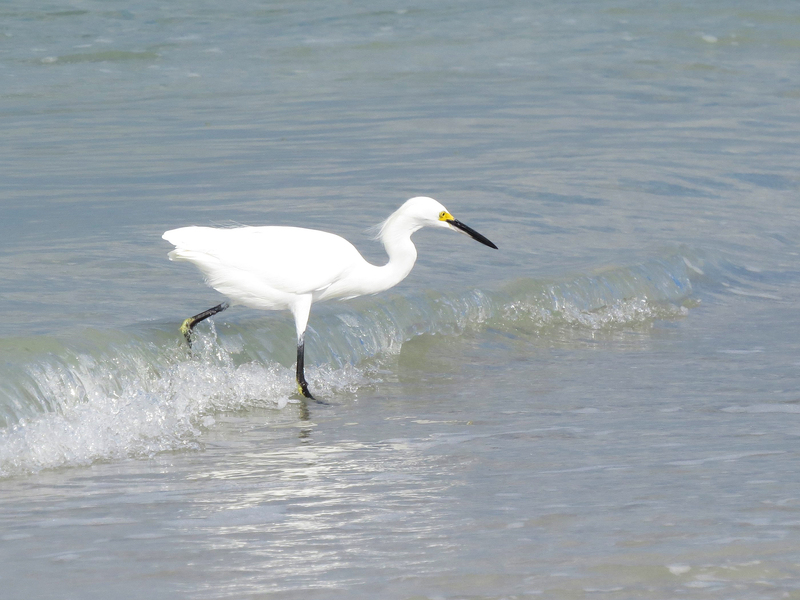 Pelicans were flying back and forth close to the water, tiny Sanderlings were running around on the sand picking food, and to my surprise a Snowy Egret was fishing in the calm waves rolling in. A welcome committee already on the beach. 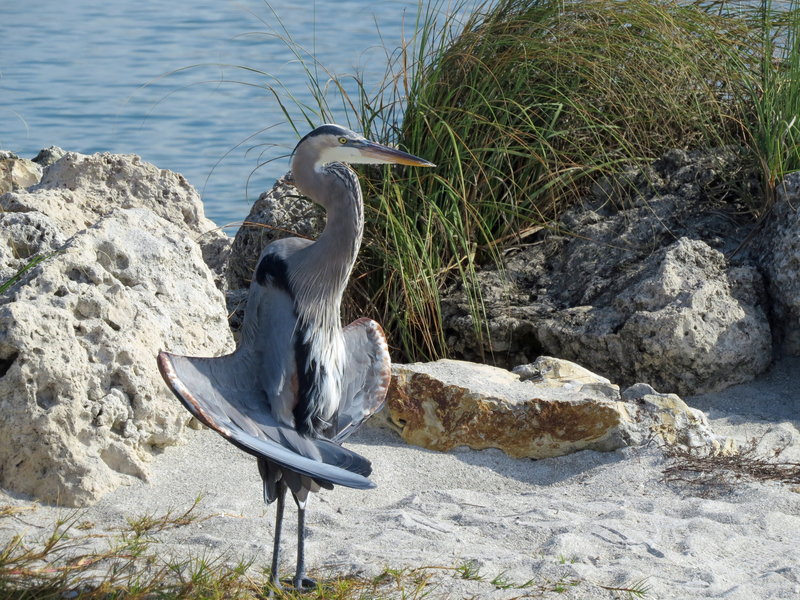 When we reached the north end of the beach, Mister Blue Heron had courteously come to welcome us to the park and the salt marsh. I made introductions and we got some nice pictures. 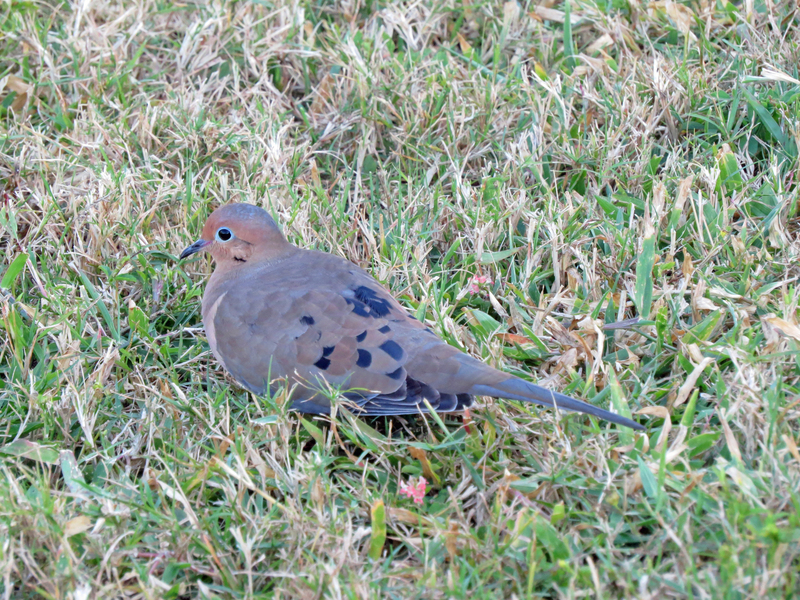 As we walked through the park, we spotted a beautiful Mourning Dove in the grass. 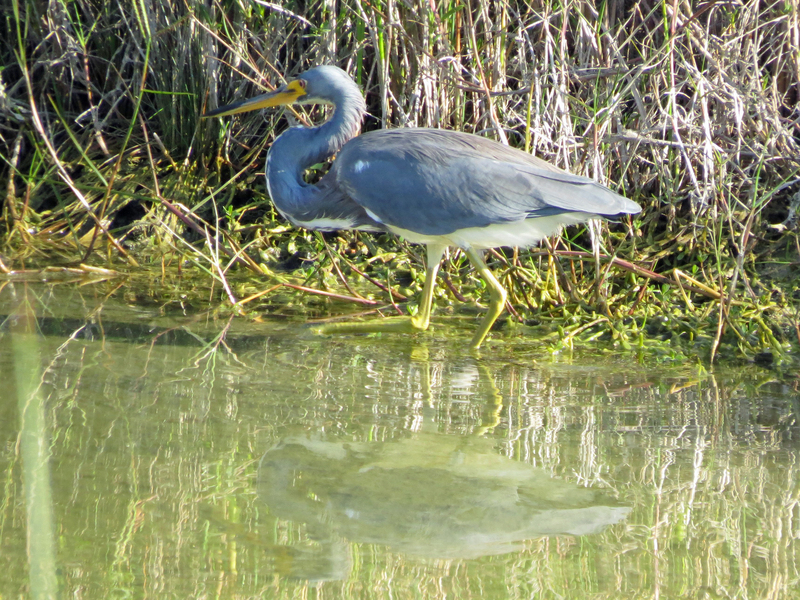 And reaching the salt marsh we observed a Tricolored Heron fishing in the shallow waters. I was happy to see we still had some visitors. 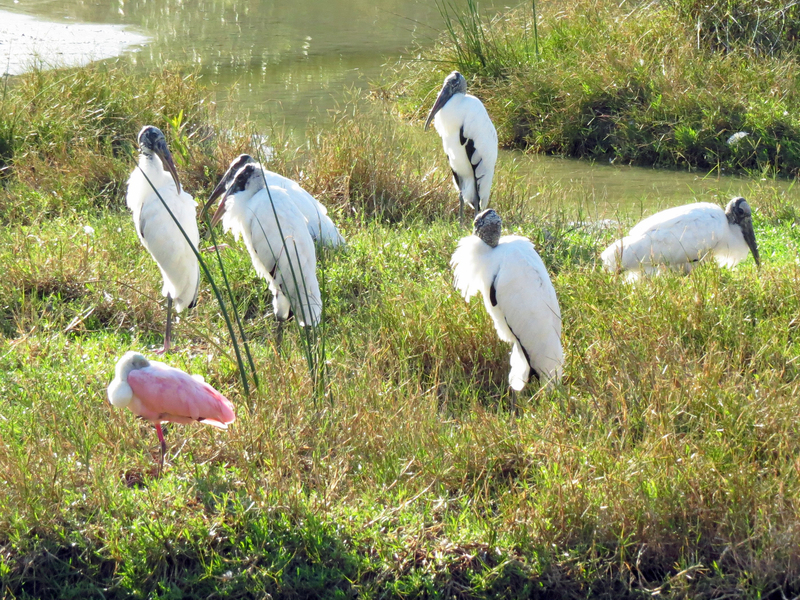 A team of Wood Storks was guarding a sleeping Spoonbill. He was taking an after lunch nap, I assumed. 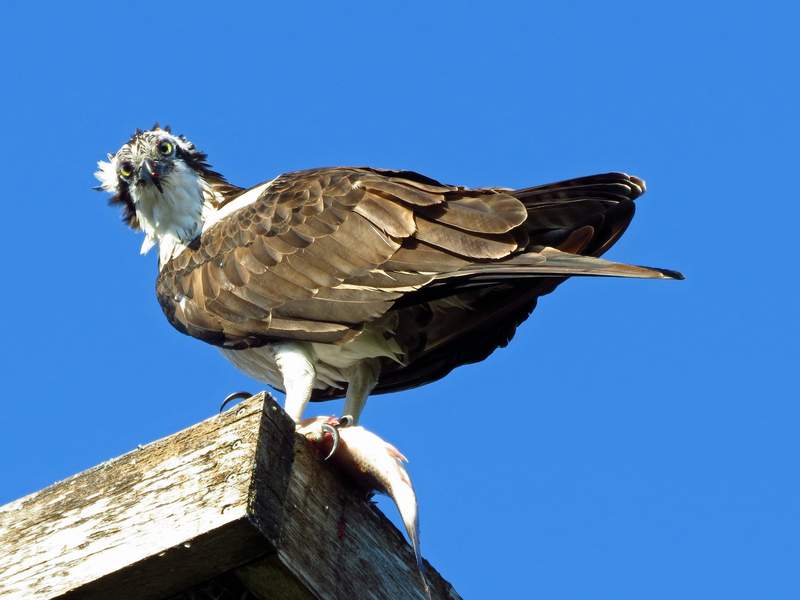 I made some quick introductions again, but was in a hurry to see if I could introduce my most cherished friend, Papa Osprey. And he didn’t disappoint. He was having lunch. He saw I had someone important to introduce so he interrupted his eating for a while to say hi. So very thoughtful of him. After saying our goodbyes to him we walked back home. 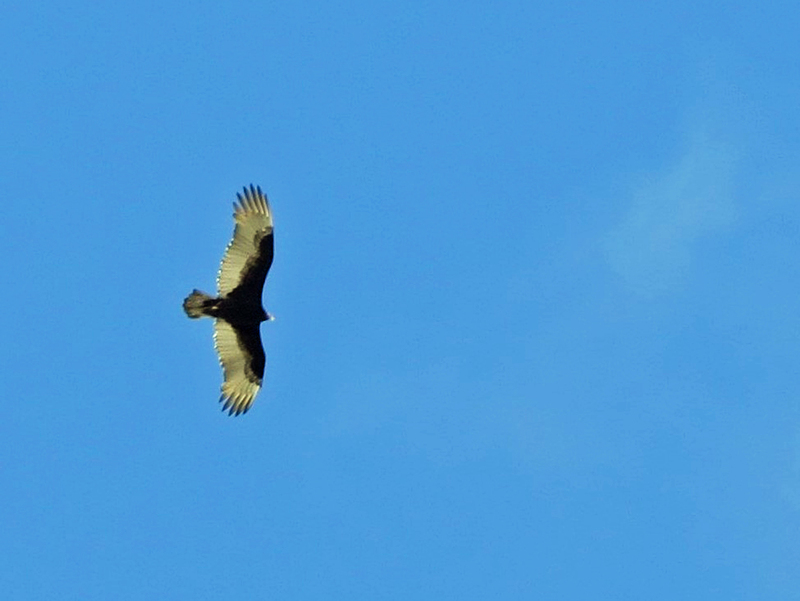 And saw a new guy on the block circling high above the beach, a Turkey Vulture. I have no idea whether he’s moved in or was just visiting over the weekend. It was a great weekend, but now we’re all back to work. Mine being to finish the first draft of my second book before the end of the month. I’ll need to catch up on my word count as writing was not a priority over this particular weekend. I’ll try to catch up on your blogs as well this week. Thanks Jackie! It was a truly wonderful weekend, and I’m so happy my son could see P.O. 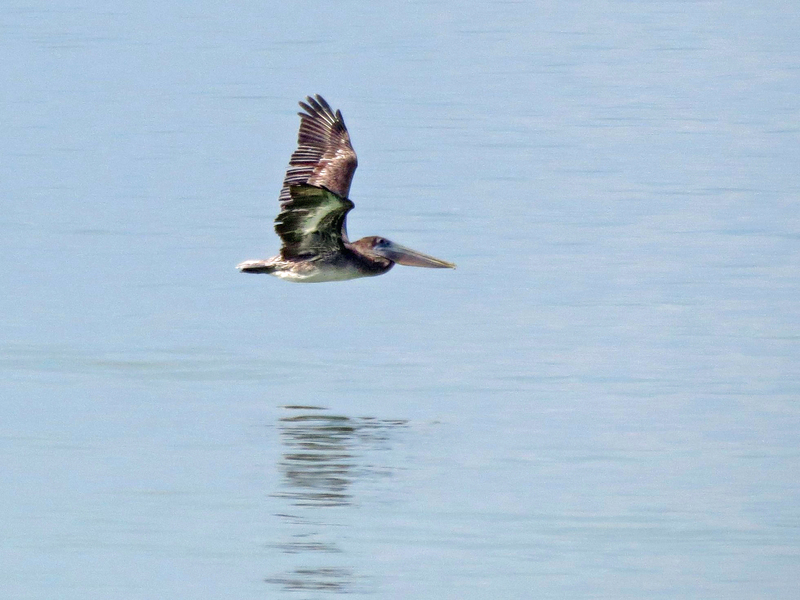 and many other residents of the marsh as well. And they all behaved 😀 Looking fwd to your message! Hugs! What a great walk around the neighborhood! Thanks Bruce! Yes it was a great walk, I was happy our son could see the birds “live”. It truly was! Thanks Kathy. I know you enjoyed your son’s visit! Glad the weather was especially nice for it. And your weekend photos are outstanding! Enjoy I did 🙂 Today is a rainy and stormy as the cold front is coming through… the weekend feels like a treat! I hope you’re not as soaked as we are here. Glad you had a chance to introduce your son to your feathered friends. How wonderful that all your friends came out to greet your son! So many beautiful birds on show! Love the Wood Stork delegation. 🙂 So happy to see Papa Osprey again; he’s magnificent. I was happy too that the delegation stayed behind after the big conference so my son could see them. And that P.O. was at the nest showing off his catch. I guess, he’s now waiting for Mama Osprey’s arrival to start the “nestorations” either in late December or early January. 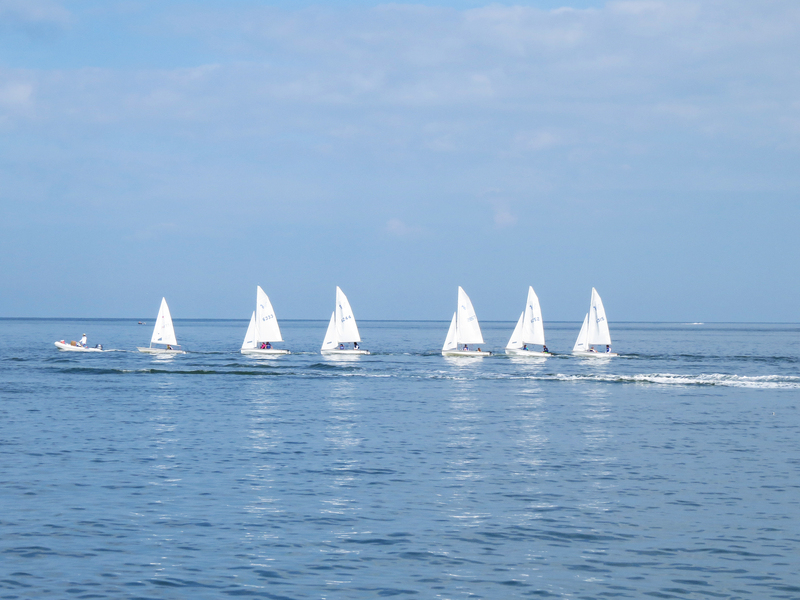 Thank you for those beautiful images– and taking me to sunshine and a rich water world! As darkness and cold descends here, those images become even more precious, and appreciated. Best to you!! I was born in the very north of Europe, so I know how it is this time of the year, dark and cold. So I’ll keep posting sunshine and ocean pics all winter long for you! Thanks kindly Mag! It was a double treat for me 🙂 Many hugs to you too!